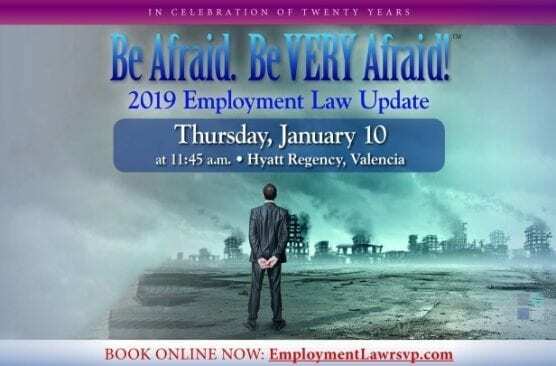 Santa Clarita business law firm Poole & Shaffery, LLP and the Santa Clarita Valley Chamber of Commerce will host the 2019 Employment Law Update luncheon at the Hyatt Regency Valencia on Thursday, Jan. 10 from 11:45 a.m. to 1:30 p.m. The firm’s Brian Koegle and David Poole will provide insight into legal matters affecting California businesses. The cost will be $55 for Chamber members and $65 for non-members. Register for the luncheon here or call 661-702-6977. The Hyatt Regency is located at 24500 Town Center Drive, Valencia 91355. For more information, call Cheryl Ramirez at 661-702-6977 ext. 2002.